It is always good to come home. Much as I like travelling, I always miss my family and my home. I am very happy to be back. These past few weeks, my husband and I along with friends were in England. The first week was spent on the Isle of Wight, walking as the Brits say or hiking as we say. And it was quite a marvelous experience. Freshwater Bay House was our base. From there we walked with a group and a leader for most of the day (fr. approx. 6 to 9 miles daily) . The leaders or quides were excellent and the group members were so interesting. There were opportunities to get to know each other during the hike and at meal times. It was amazing to me how diverse the backgrounds were of the walkers. Allyson (or Alison,Alyson,Allison? )was a delightful companion. She heads up an ABI unit at a hospital. “Hello Allyson…..on our way to London, we talked about how much we enjoyed your company.” One walker was a psychologist from NYC, another a bio-chemist from England, another an author from the Netherlands, another a customs lawyer from the Netherlands. There were 2 women from Belgium, as well as a walker from Scotland and one from Australia. To say that this was one of the most interesting and absorbing holidays we have had would be an understatement. Our group of 6 was known as the Canadian contingent. An amusing story-red squirrels are regarded highly and there were blinds in the forests so that there might be an opportunity to see one of the squirrels. Squirrels are not indigeneous to England…..we have lots here that I would be happy to export. Our second week was spent in London, very near Trafalgar Square which was an ideal spot. We went to Windor to see the castle, toured Buckingham Palace, the Tate Modern (art gallery). There I saw my first Mark Rothko-an artist that I admire. As well we saw an exhibit at Kensington palace of gowns worn by Queen Elizabeth, Princesses Margaret and Diana (not the men at this one). We did something every day-walked the towpath of the Regent Canal system and saw the barges, some of which were now homes, went to markets, shopped and walked and walked. By chance,in Portobello market, I found some lovely new gemstones that I will be working with for the fall Studio Tour. This was a bonus as I found a supplier online but when I went to the location, the selection was very small. The weather was great the first week and we only had one bad day on rain the second. So we were lucky indeed. 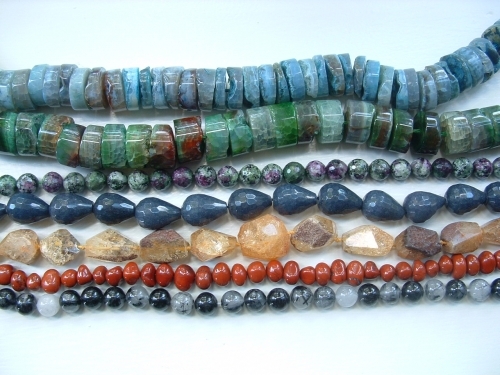 Starting at the bottom, the stones pictured are rutilated quartz, red jasper, rough citrine, blue agate,ruby zoisite, green and turquoise agate. The fall studio tour is coming – OCTOBER 19 & 20, 2013 10 – 5 p.m.